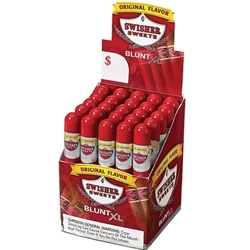 Enjoy the refreshing sweet natural flavors each time you smoke a Swisher Sweets Blunt XL. Created with a unique mix of tobaccos that are covered with a natural wrapper, these cigars promise a rich taste and heady aroma with a smooth draw and slow burn. Each Swisher Sweets Blunt XL is packaged in a crush proof tube. Try them today at Smokers Discounts!